Inflammation is one of the key mechanisms that generates pain in the human body. When the bones, muscles, and joints in your body are over-worked, injured, worn, malaligned, or suffering from a related condition, those parts of your body are often subject to inflammation -a natural reaction to such problems. Unfortunately, inflammation is also accompanied by powerful pain signals. 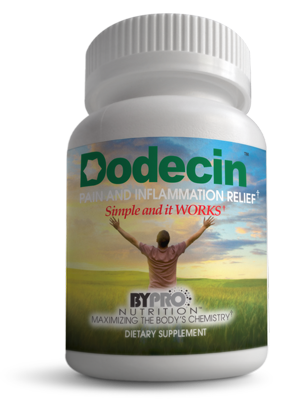 Physician recommended Dodecin™ contains 12 ingredients that work synergistically with one another to directly address inflammation when it occurs, and thus, reduce the associated pain. Dodecin™ is so much more than just another joint formula! Yes, it definitely addresses joint issues but goes further to suppress inflammation pathways associated with nerve, muscle and bursae issues. In using these 12 quality ingredients we see and hear about amazing results in a short length of time. Want to know more about the science behind Dodecin’s ability to relieve pain? Read the academic medical research studies here.